One of the most famous culinary creation from Sandakan, a small town on the east of Sabah famous for its food, is the ngew si doi (cow poo heap) or ngew si tud (cow poo tart). 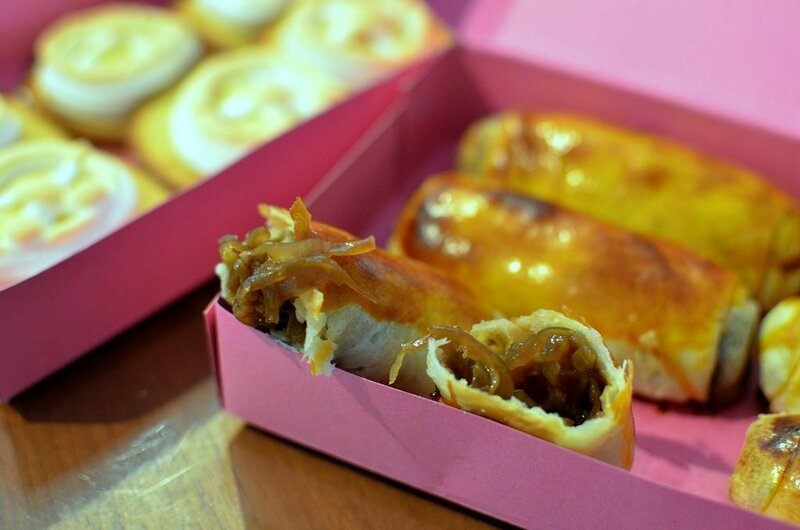 Those names make some people uncomfortable, so euphemistically and outside of Sandakan, the tarts are known as UFOs. However, that polite and boring name belies the feisty spirit of Sandakanites (Sandakanians sound hick) who became known as people of strong principles in the 80s because they steadfastly supported the opposition party. There aren't many places where you can get poo tarts and I used to get them from Kedai Kopi Mee Ngar in Iramanis but the last time I ate them months ago, they tasted of cheap margarine and were too sweet. Into my house yesterday walked Steph and her daughter, bearing with them two boxes of goodies from a restaurant operated by Sandakanites. One box contained rice wine-flavored chicken rolls and the other, ngew si doi. I have the original recipe for ngew si doi from the coffee shop in Sandakan where the tarts were first made. It was given to me by a friend whose sister's maid worked in the kitchen of the coffee shop (a coffee shop here is literally that, a place where local coffee is served throughout the day, along with bread and pastries). Unfortunately, the shop guarded the recipe by keeping part of the recipe from the maids so what I've got is how to make the 'poo' (the rich yummy custard) but not the base of the tarts. I've tried many times to make the base, which has a neither soft or hard texture like madeleines, but failed to get a satisfactory clone. The 'poo' though is better than those in the shops because I don't scrimp on the ingredients. As far as I know, the ngew si doi recipe is not googleable--it just isn't available. 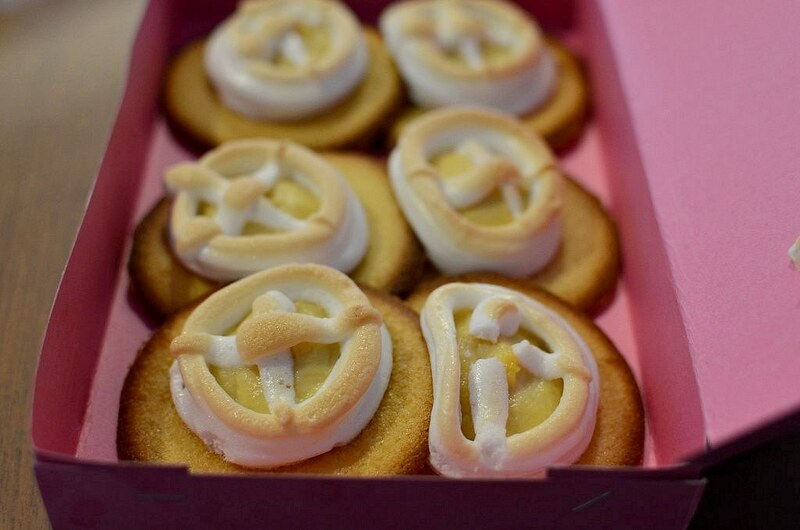 These ngew si tarts were better than any in KK. They weren't too sweet (in fact, they are a little too salty) and there was no strong margarine flavor either. Rice wine-flavored chicken rolls were good but the filling was mostly onions. Also, that strong orange color is likely due to coloring, not egg yolk. Still, it was tasty and flavorful and I would drive there for this. Kedai Kopi Sin Sin in Inanam (the new shoplots) is where you can get the tarts and rolls. I haven't been there yet but I will soon. A friend recently directed me to Kedai Kopi Man Soon Hin (name to be confirmed) in the first row of the old shoplots just after the Inanam roundabout for bittergourd noodles. I love bittergourd (those heading to Hong Kong should try bittergourd sherbet, something I haven't eaten before but want to) and so I packed the whole family into the car one hot mid day last week. Duck slices and rice noodles in bittergourd soup. Look at that presentation. I mean, really, which other shop goes to that extent? I love that they cared enough to make every bowl of noodles look good. However, the soup didn't impress us. My bowl of mixed pig offal and noodles in bittergourd soup. 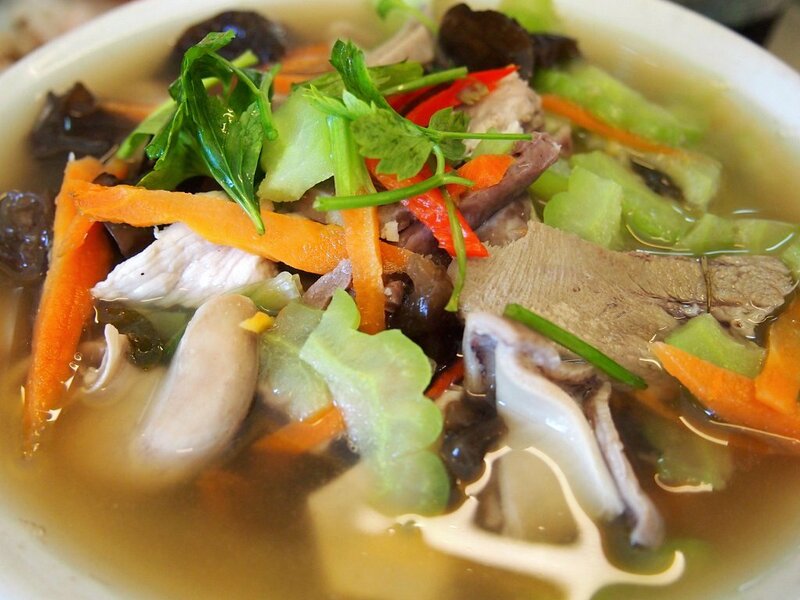 Why was this soup so ducky-flavored too when there's no duck in it? 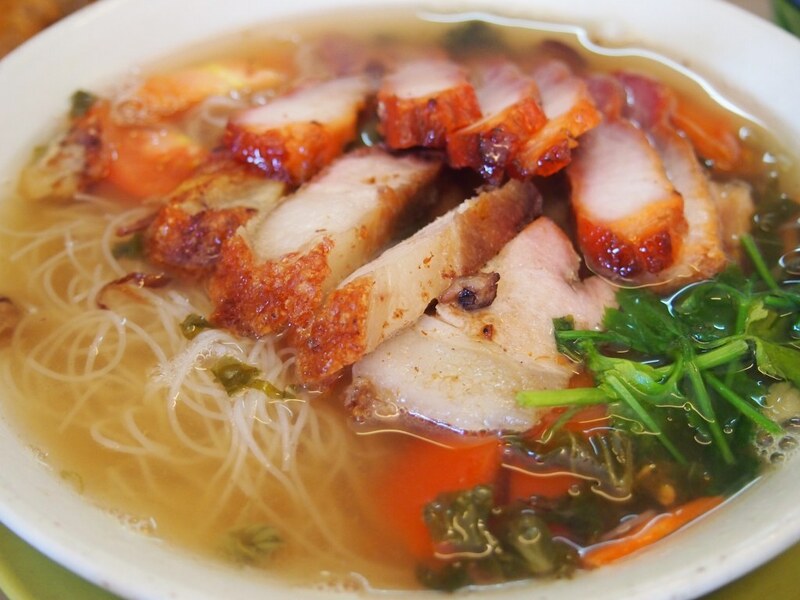 Roasted pork and rice noodles in salted veg soup. 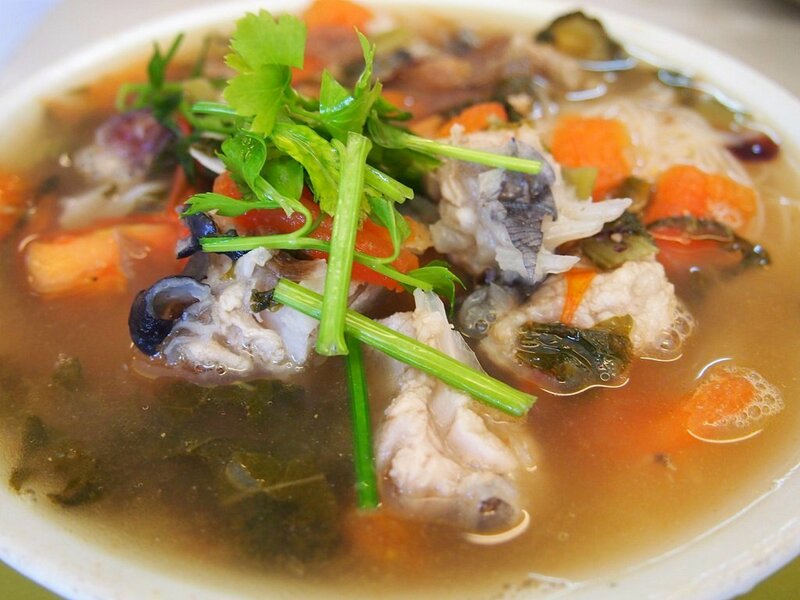 Fish head rice noodles in salted veg soup. 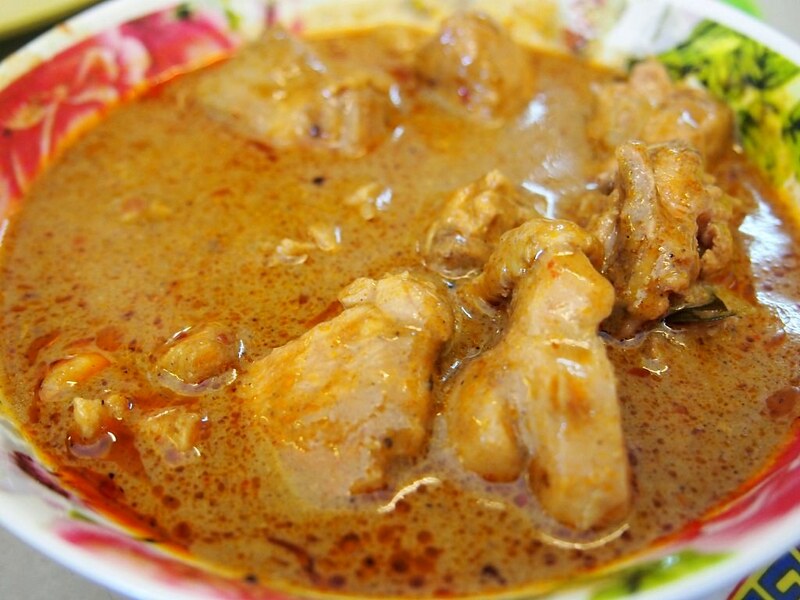 The curry chicken was okay, not extraordinary. The noodles were RM6 per bowl and there were more toppings than most other places. 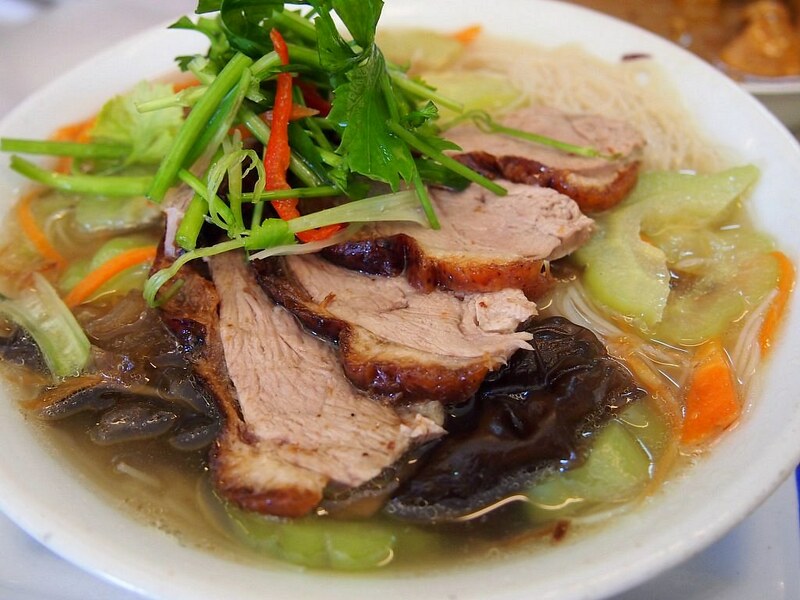 However, unless you like your soup noodles ducky-flavored, it's better to stick to duck or roasted pork rice. I assume the rice isn't duck-flavored. Oh those cow poop tart brings back so much memories of childhood as my late father was from sandakan & every time we visit, we get these tarts. Want to recreate the recipe one day. Thanks for sharing. Found this clip in youtube. It was aired some years back. Surprisingly this tart is hainanese, somehow it reminds me of lemon meringue tarts. Awesome recipes,Looking very delicious.Noodles have a great natural source of fibre and because they have little taste of their own..
May I ask what kind of camera and lens are you using? Your pictures are really good. malaymui: it is yummy and i will bring you to the shop on your next visit. annant: two months and you didn't eat cow poo tart! lily: why don't you work on the base and we can clone the recipe? do check out the link given in the comment after yours--the tart base seems to be quite a fluffy sponge mix. need to get those concave moulds too. anon: what a great link; thanks!!! the poo tarts in the vid are so BIG, esp the meringue. they've downsized the tarts now, miserably, yet increased the price. couldn't get the recipe off the vid but at least got to see the consistency of the batter and the tart moulds. hmm. maybe it's time to get cracking on the recipe. janine: you've got to try them, esp at the original shop. pls see the link in the 4th comment. anon: thanks! all my photos after may 2011 were taken with the nikon D7000 using either the kit 105 mm lens or the 35 mm lens. before that, i used the panasonic lumix fz50, a good point and shoot with very good leica lens but i couldn't get very bokeh photos. in this post, the first two photos were taken with my nikon D7000 and a 35 mm lens but the rest of the photos were taken with the new olympus four thirds camera, PEN Lite PL 3 which I won in the Royal Selangor Jelliriffic! Challenge (check my 'western recipes' link). the olympus gives very vivid colors and is very handy. i still need to figure out a lot of the features though. love it. Inanam is too far for weekday lunch for me, but I'll check it out on weekends. Thanks. Though I am more of a Canon girl, I must admit your Nikon shots are good. The pics taken with Olympus are really impressive. Btw, congratulations for winning the Jellirific. I have been reading your blog for nearly two years now and I have used a couple of your recipes. I also read Yi's blog, thanks to you. She is a very talented girl like you. Thanks for sharing your recipes and adventures. fooman: yes, inanam is too far away n the traffic's always bad. try going on weekends. anon: thanks:))), keep in touch! Do you mind sharing the recipe for ngew si tud, i love this tart, and has been searching for the recipe.